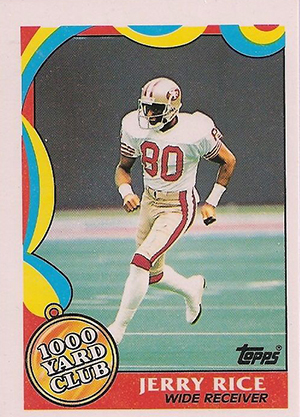 1989 Topps Football has been largely forgotten in the years since its release. Like most sets from the era, it was printed in very large quantities. And while it has rookie cards of several Hall of Famers, the checklist is missing a pair of marquee names found in other sets like 1989 Score. The release has a 396-card base set. After kicking off with a Super Bowl card and four Record Breakers, the checklist flows nicely with players grouped according to their team. Top teams appear first. 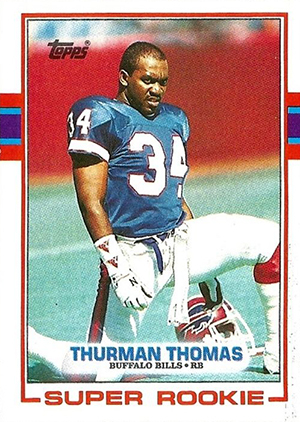 Rookie cards in 1989 Topps Football include Thurman Thomas, Michael Irvin, Cris Carter and Tim Brown. While that's certainly a nice group, neither Troy Aikman or Barry Sanders make an appearance. Seeing as how they're the top 1989 rookies, this hurts the set's appeal tremendously. 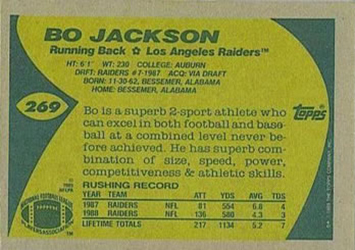 Both are in the 1989 Topps Traded Football box set. 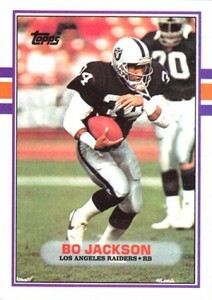 1989 Topps Football card fronts have a rather thick white border. Towards the top, there's a three-barred stripe that runs in the background. It's kind of like the stripes on a pair athletic socks. Backs are somewhat bright, at least as far as brown card stock goes. Yellow and green in color, they include vitals, basic stats and, depending on space, a writeup. Building the set is straightforward. Each pack comes with one of 24 different glossy 1000 Yard Club inserts. The only other inserts are Box Bottoms. These come in four different four-card panels on the underside of wax boxes. Packs can be found in both regular 15-card packs and 30-card cello packs. Wax boxes come with 36 packs. Cellos have 24 packs. 396 cards. Shop for base sets on eBay. The set has a clean design. The photo takes up much of the card as it should be. Overall a good effort.